Dislocations of the finger joints are common injuries, especially in sports like football and basketball. 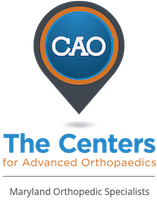 They are treated by Dr. Peter G. Fitzgibbons, MD at The Centers for Advanced Orthopaedics: Maryland Orthopedic Specialists Division. Dr. Fitzgibbons is fellowship-trained in both orthopaedic trauma and hand surgery. With locations in both Germantown and Bethesda, Maryland, he and a team of orthopaedists, hand therapists, and physical therapists offer a comprehensive range of services covering the diagnosis, treatment, and recovery from finger dislocations. What exactly is a joint dislocation? The finger joints are held in place by thick ligaments. With a strong enough force, these ligaments can tear and allow the joint to pop out of place. 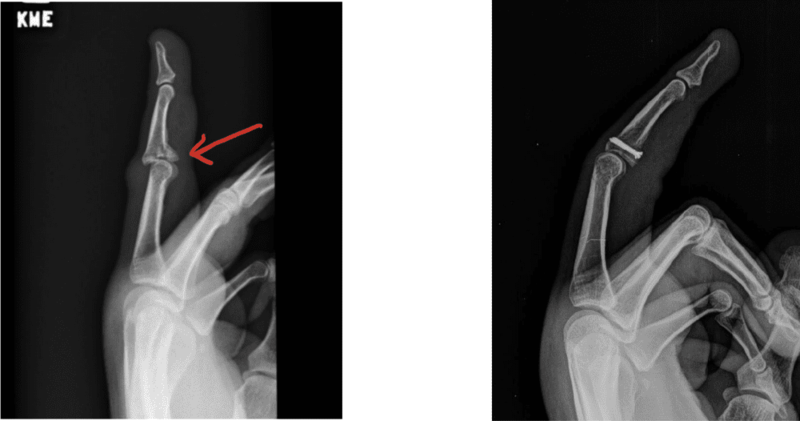 How is a finger joint dislocation treated? Initially, the joint needs to be put back in place, and this is often done relatively easily on a sideline or in urgent care or emergency department. Occasionally, the joint can’t be reduced and can require surgery to get it back in place. Once reduced, most finger joints are very stable, can be moved after a brief period of splinting, and only require home exercises to minimize stiffness. An x-ray should be done following reduction to ensure that the joint is in place and make sure there are no associated fractures. Sometimes fingers get very stiff following dislocations and can require hand therapy to get motion back. The fractures associated with dislocations need to be assessed carefully because they can make the joint unstable and in those cases would need surgery to restore joint stability. What is surgery for a finger joint dislocation like? Surgery for a finger dislocation is an outpatient procedure and can be done with local or general anesthesia depending on the circumstances. The surgical procedures are varied and can involve making an incision to get the joint back in place, fixing an unstable fracture, or releasing scar tissue to improve motion in a joint that’s become stiff after a dislocation. Dr. Fitzgibbons performs most of these procedures at the Massachusetts Avenue Surgery Center, an outpatient surgery center that provides a safe, patient-oriented experience in a friendly and comfortable environment.